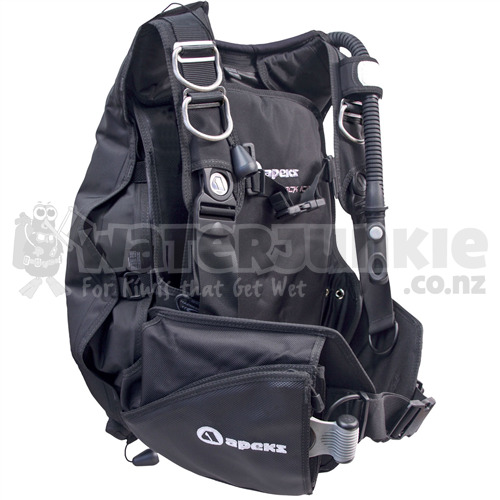 The APEKS Black Ice is a Rugged, Weight-Integrated, Back-Inflation BC designed with the Advanced-Diver-in-Mind. Despite its Heavy-Duty Construction, it provides Amazing-Comfort, Fit and Stability thanks to its Wrapture Harness System (pat. pending). Due to the Modular-Nature of this BC, a Custom Fit can be achieved through any of the three sizes. The Black Ice is offered in one color only, you guessed it, black. The Wrapture Harness System, utilizing a Specialized Back-Plate, Valve Retention Strap and Swivel Shoulder Buckles to provides Unsurpassed Comfort. 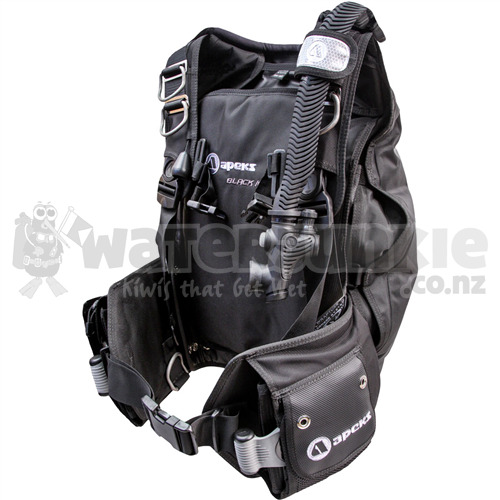 The Wrapture Harness System not only Hugs-the-Contours of the Body providing Superior Comfort and Stability, it also Supports the Scuba Cylinder in a way that has never been more Comfortable to the Diver. The Wrapture allows you to Stand-up-Straight in Total Comfort while the Cylinder remains Perfectly-Vertical and pulled in Close while preventing "Ride-Up" at the Surface. The Black Ice features the Patented and Innovative Sure-Lock II Mechanical Weight Release System with 32 lbs (14.5 kg) Capacity in all sizes. The Sure-Lock II is Easy to Load and remains Secure until you want to release it. The Sure-Lock II Weight Pockets align themselves. Just Insert-the-Pocket until it "Clicks". A simple, Single-Pull Release is all that is needed to jettison the weights in an emergency. The Black Ice also has Fixed Non-Releasable Weight Pockets in Back with Capacities 10 lbs (4.5 kg).The 3-Flat E-Valves, One on the Right-Shoulder and One on the Left-Lower-Rear and One on the Right-Lower-Rear Reduce Drag and keep the BC Streamlined. The Valves are designed as One-Way to keep Water-Out. The Black Ice comes equipped with Aqua Lungs Power Line Inflator with an Increased Fill Rate which is now, one of the Highest Air Flows in the Industry. The Power Line is an Environmentally Sealed Unit for less maintenance, has Integrated-Hose Clips for attachment to the LP Hose for a Streamline and Low Profile. The Inflator is equipped with a Cable Activated Rapid Exhaust at the top, simply Pull-Down on Lower Unit to Dump Air. The Left Pocket is a Fold-Down design with Deep-Capacity, perfect for an Extra Mask. The Right Pocket is a Large-Utility-Pocket secured with a Robust Zipper Closure. Knife Attachment Points are found on the Left Pocket Flap which will accommodate many of the Wenoka Squeeze Lock Knives. This location provides easy access to the knife. The Black Ice feature 5-Large, Angled, Stainless Steel D-Rings for all of your Accessories and the Rolled Neck Collar provides Comfort. 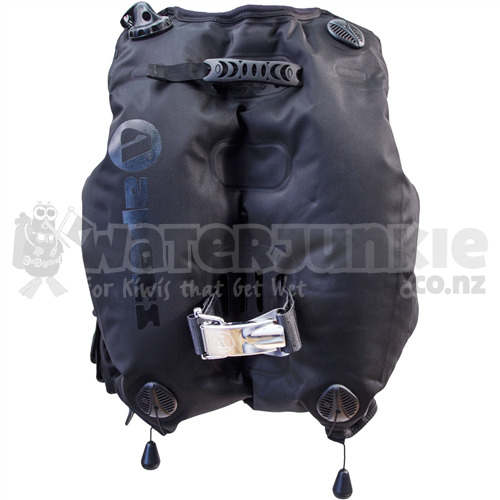 The Black Ice BCD provides 52lbs (23.6kg) of Lift, comes with a 3/8" Threaded Low Pressure Quick-Disconnect Hose, Owner's Manual. Weight Pockets Align Themselves: Insert-the-Pocket Until it "Clicks"